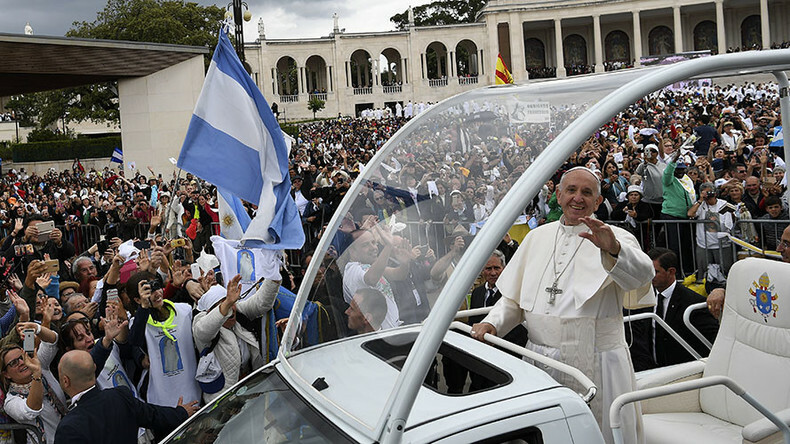 Hundreds of thousands of believers gathered in the small Portuguese town of Fatima, which is also one of the world's major Catholic shrines, as Pope Francis canonized two of three children, who reported visions of the Virgin Mary there 100 years ago. "We declare the blissful Francisco Marto and Jacinta Marto saints," the pope said after a mass at the shrine complex in the town of Fatima located north of the Portuguese capital of Lisbon that marked the centenary of the apparitions of Madonna to the Marto siblings and a third child. The announcement was met with loud applause by a crowd of worshippers that consisted of about a half million of people, who came to Fatima for the landmark ceremony. Some believers came to the shrine from countries as far away as Canada, China, Venezuela and Brazil. The pontiff arrived in Fatima on Friday evening and led a candle-lit vigil at the Chapel of the Apparitions built at the exact location where the three children reported seeing the Virgin Mary. 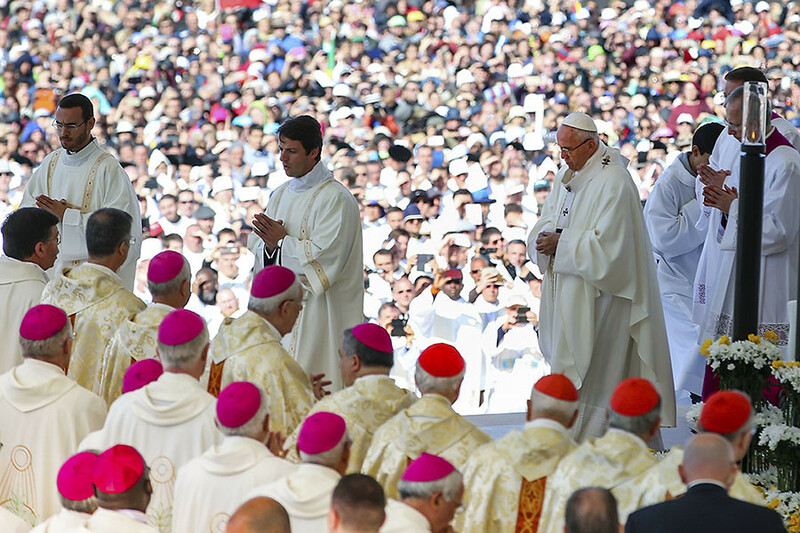 During the Saturday mass, Francis urged Catholics to use the example of the Marto siblings and to draw strength from God, even in the face of adversities and challenges. The two siblings lived in Portugal in the early 20th century when the Portuguese church was persecuted under anti-clerical laws issued by the republican government. After the children publicly revealed that they saw Madonna, they were threatened with death (by being boiled in oil) but they refused to publicly disavow their declarations. Francisco and Jacinta, who were aged 9 and 7 at that time, and their 10-year-old cousin, Lucia, first spoke of seeing the Virgin Mary on May 12, 1917. They said they saw a "lady dressed in white" and shining with a bright light when they were grazing their sheep. Madonna was said to have appeared to them five more times between May and October 1917. During one such apparition, which took place on July 13, she is believed to have made three prophecies that were later known as the secrets of Fatima. The first prophecy described a “great sea of fire,” demons and human souls. It was interpreted as a vision of the World War II. The second one referred to the persecution of the Church in the Soviet Union. The third prophecy had long been concealed by the Catholic Church. In 2000, the Vatican said the third prophecy was a prediction of the 1981 assassination attempt on Pope John Paul II on May 13, the same day when Madonna’s first apparition was said to have taken place in 1917. The prophecy mentioned "bishop dressed in white" — the pope — on his knees at the foot of a cross killed in a hail of bullets and arrows, along with other bishops, priests and various lay Catholics. The Marto siblings died two years after the visions during the Spanish Flu pandemic in Europe. Lucia, the third child who saw the apparitions, became a nun and died in 2005 at the age of 97. She was the one who described the apparitions in her memoirs which she started writing in 1935. Pope John Paul II visited Fatima three times and beatified the siblings in 2000 after he survived the 1981 assassination attempt. He credited the Virgin of Fatima with saving his life. 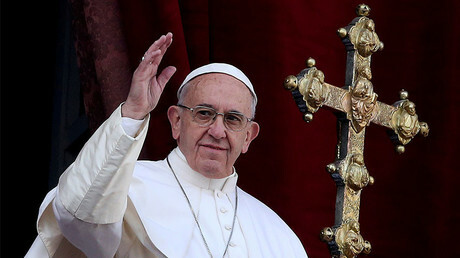 A bullet that hit the pope was then placed in the crown of the statue of Our Lady of Fatima. Over the 20th century, Fatima emerged into a major pilgrimage destination after the Catholic Church recognized the apparitions as authentic in 1930. The town is visited by some 7 million people every year. Traditionally, pilgrims walk at least part of the stretch to the town. Some pilgrims then cross the esplanade leading to the shrine of Madonna on their knees or even crawling. On Saturday, more than 500,000 people gathered around the shrine, media reported, citing local authorities. 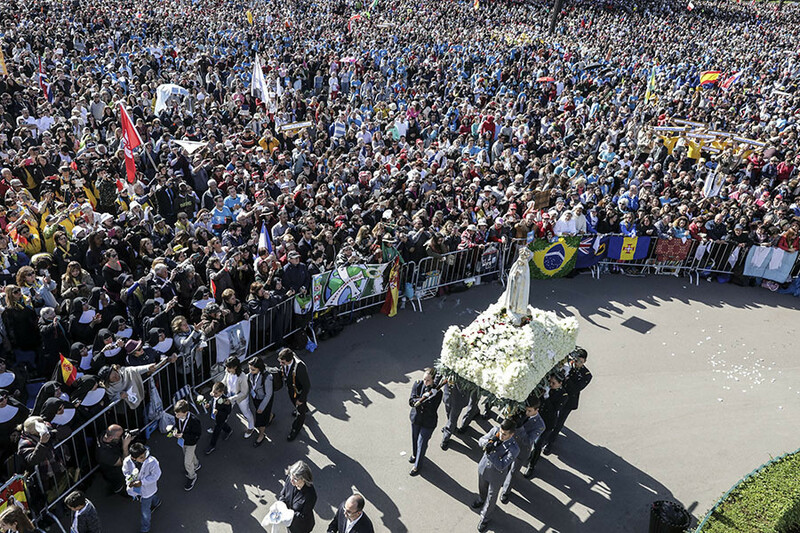 Two notable attendees were Brazilians Joao Baptista and Lucila Yurie, the parents of a boy called Lucas, whose medically inexplicable healing was considered a miracle that led to the canonizations of the Fatima siblings. In 2013, Lucas, who was aged five at that time, fell from a window 6.5 meters above the ground and suffered a serious head injury. Medical specialists said he would be mentally disabled or would remain in a vegetative state if he survived. However, the boy did not only manage to survive, but also shows no signs of any post-trauma effects. "We thank God for Lucas' cure. We know in all faith from our heart that this miracle was obtained with the help of the little shepherd children Francisco and Jacinta," Baptista told reporters on Saturday. The Portuguese authorities took extensive measures to provide security for the event. Some 6,000 police officers and emergency service workers were deployed while concrete blocks were placed on all roads leading to the shrine to prevent any potential terrorist attacks involving vehicles. Portugal also temporarily re-introduced border checks and suspended the Schengen agreement on open borders for the day of the mass. Only nine border crossings were open on Saturday.